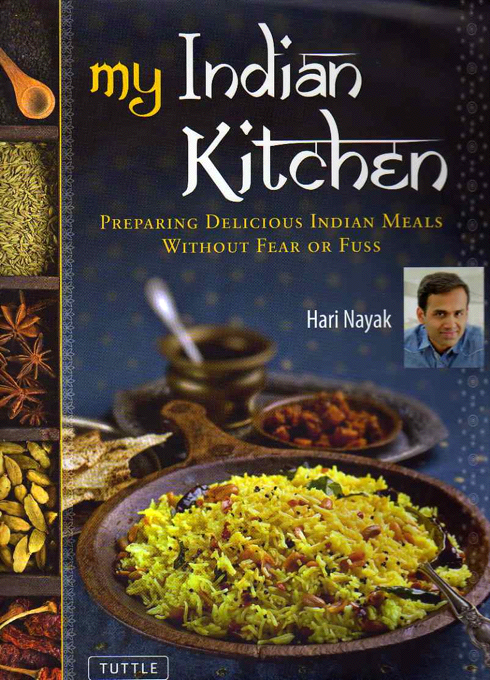 What makes Hari Nayak‘s My Indian Kitchen: Preparing Delicious Indian Meals Without Fear or Fuss (Tuttle 2011) such a good book is that he takes his time to explain all those parts of Indian cuisine that are intimidating and seemingly complicated. From explanations of techniques and step-by-step photos by Jack Turkel to good head notes to each recipe, Hari has crafted a thoughtful and useful book. It is important not to skip over the early chapters in the book – Hari goes over techniques, like roasting and grinding spices (p. 16) followed by a guide to tools, and in introduction to ingredients with helpful photos so that you can identify fenugreek leaves in the market. Best of all is a chapter on Indian Spice Mixtures like Indian Grilling and Roasting Rub (p. 33) and Home-Style Garam Masala (p. 35). The chutneys and accompaniments are in chapter 2, including both Sweet Mango Chutney (p. 41) with cardamom pods, fennel seeds and chili, and Green Mango Pickle (p. 47) with black mustard seeds, fenugreek seeds, and dried curry leaves. The spice mixtures are used throughout the book. Red Masala Paste (p. 32) is used in Mangalore Fish Curry (p. 105) while Home-Style Garam Masala is used in many of the meat dishes including Traditional Lamb Curry (p. 115) from northern India and Spicy and Fragrant Lamb Curry (p. 119) and Pork Tenderloin with Mango Salad (p. 119). This book is a guide to create a meal – not just a single dish. My Indian Kitchen would make a wonderful gift for someone who is starting to explore Indian food. The recipes range from complex to simple and quick – all are presented with clear steps and expert guidance.